Since I discovered them in the 1990s, instrument decals have been a staple part of my modelling toolkit. They're great for adding convincing detail, and far quicker and easier than picking out the details on a tiny dial by hand. The trouble was, the sets I found (first by Reheat and more lately by Mike Grant) have all been aimed at the WW2 era, so their usefulness on early aviation subjects was severely restricted. The reason was twofold; the faces often just looked too modern, and the selection didn't include black characters on a pale dial as seen frequently on early instruments. Now Airscale have released two new sheets designed specifically for WW1 modelling, available in 1:48 and 1:32. Each sheet carries a selection of Allied and German instruments – and, yes, some have the black characters on white faces. A beauty of the Airscale decals (unlike previous systems) is that the faces are printed as individual decals, so you can simply cut them out and slide them into place conventionally without any need for an expensive punch and die. The sheets are printed by Fantasy Printshop and the quality is superb, with pin sharp registration and minimal carrier film. The decals can be applied to the front of a kit dashboard, or positioned on a backing plate behind a perforated instrument panel. If you prefer the latter style, Airscale have included a thing sheet of glazing film along with the decals. The sets include a simple set of instructions and a list of the instruments included. In 1:32 the dials are actually numbered on the list and on the decal sheet, so picking the specific instrument you need is simplicity itself. Strangely, they aren't numbered in 1:48 (although could always use the picture of the 1:32 sheet on Airscale's website as a guide. This small oversight is the only reason I haven't given a 100% score – otherwise I simply can't fault the sheets. 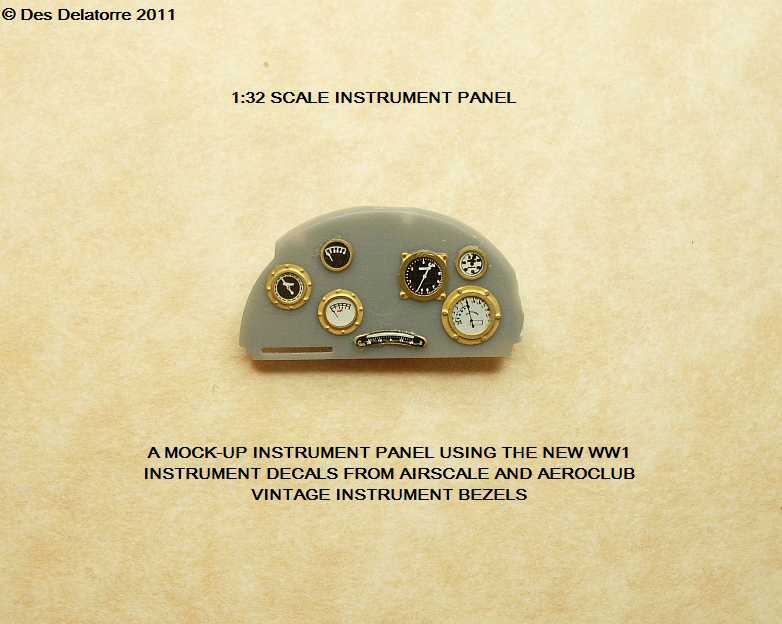 Of course, many WW1 instruments continued to be used for years following the conflict, so Airscale's decals are also ideal for Golden Age subjects, possibly in combination with their WW2 sets (reviewed HERE) for the crossover period of the 1930s. Airscale's instrument decals are fantastic. They are simpler to use than comparable products I've tried, and the first I've found catering specifically for early aviation subjects. Whether you want to bring a standard kit cockpit to life or are a dedicated superdetailer or scratchbuilder, these decals are an almost indispensible addition to your modelling armoury. Unreservedly recommended. Highs: Affordable, easy to use, highly detailed and precisely printed. I too have seen these recently and can say that they are quite impressive. Now all we need is someone to produce PE bezels (Metal outer rims of the instrument gauge mounts on the dash panels). Thanks Rowan for posting these. Here is a photo of the Airscale instruments I mounted onto a mock instrument panel, the decals are so easy to use and adhere exremely well. I also fitted Aeroclub vintage bezels which are also a great product, the two brilliant products compliment each other and will make a really good looking instrument panel. Des. I forgot to mention that the decals are available from; LINK and with the bezels contact; sales@aeroclub-models.com Des. I have just received news from Peter at Airscale that he and John at Aeroclub are joining forces, Peter will be retailing Johns bezels soon. This is great news as both Peter and John produce a brilliant product and when used together are a perfect match, creating the ideal WW1 instrument panel is now available to all. Des.